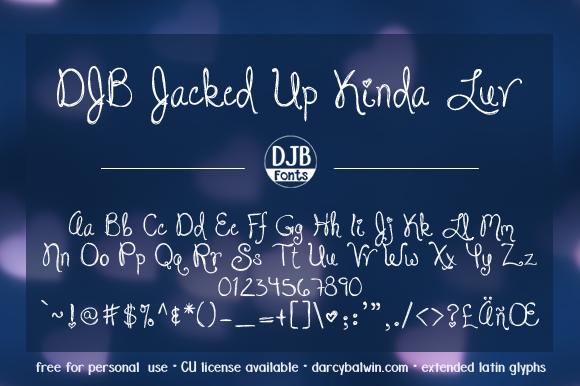 This is a free for personal-use(not-for-profit) font, made in conjunction with Lauren Grier. DJB Jacked Up Kinda Luv is made in conjunction with Lauren Grier. It's a scribbled, decorative font for marketing, logos and more. This font contains 1 .ttf/.otf font file, which includes full alphabet, numbers and most common punctuation as well as extended Latin glyphs. See product view for details. UPDATED 9/2016 with additional composite glyphs and kerning corrections.